A Special Court in Dhaka has sentenced two former leaders of the al-Badr killing squad to death for war crimes committed during Bangladesh’s war of liberation in 1971. Chowdhury Mueen Uddin, a Muslim leader based in London, and Ashrafuzzaman Khan, based in the US, were sentenced in absentia after the court found that they were involved in the abduction and murders of 18 people – nine Dhaka University teachers, six journalists and three physicians – in December 1971. Prosecutors said the killings were carried out between 10 and 15 December, when Pakistan was losing the war in Bangladesh (then East Pakistan), and were part of a campaign intended to strip the newborn nation of its intellectuals. ‘Justice will be denied if they are not given death sentences for their heinous crimes,’ judge Obaidul Hassan told the crowded tribunal, according to Reuters. Lawyers representing Mueen denounced the verdict and said the court had staged a show trial. In May, the GMBDW reported that Chowdhury Mueen-Uddin tied to the Global Muslim Brotherhood and Hamas support in the UK, had been indicted in Bangladesh over the 1971 war crimes charges. Since moving to the UK in the early 1970s, Mr Mueen-Uddin has taken British citizenship and built a successful career as a community activist and Muslim leader. In 1989 he was a key leader of protests against the Salman Rushdie book, The Satanic Verses. Around the same time he helped to found the extremist Islamic Forum of Europe, Jamaat-e-Islami’s European wing, which believes in creating a sharia state in Europe and in 2010 was accused by a Labour minister, Jim Fitzpatrick, of infiltrating the Labour Party. 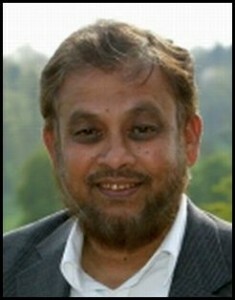 Tower Hamlets’ directly-elected mayor, Lutfur Rahman, was expelled from Labour for his close links with the IFE. Until 2010 Mr Mueen-Uddin was vice-chairman of the controversial East London Mosque, controlled by the IFE, in which capacity he greeted Prince Charles when the heir to the throne opened an extension to the mosque. He was also closely involved with the Muslim Council of Britain, which has been dominated by the IFE. He was chairman and remains a trustee of the IFE-linked charity, Muslim Aid, which has a budget of £20 million. He has also been closely involved in the Markfield Institute, the key institution of Islamist higher education in the UK. The Jamaat-e-Islami (JEI )was founded in 1941 and is Pakistan’s oldest religious party. The party had it’s origins in the thoughts of Maulana Sayyid Abul A’la Maududi (1903-79), the most important Islamist intellectual in the history of Southeast Asia. Maududi was also a major influence on the global Muslim Brotherhood with whom the JEI has long enjoyed close relations. According a report by the Center for Social Cohesion, in October 2003 the Islamic Forum of Europe (IFE) invited Anwar al-Awlaki to speak at its ‘expoislamia’ event. Anwar al-Awlaki is the pro al-Qaeda imam based in Yemen whom the Fort Hood shooter had been in contact. The CSC also reported that that the IFE operates out of the East London Mosque and shares many of the same trustees and senior management which includes Muhammad Abdul Bari, also the former Secretary General of the Muslim Council of Britain (MCB). The MCB is a UK umbrella group that has been dominated by the Jaamat-I-Islami and usually acts in concert with the Global Muslim Brotherhood. It should also be noted that the London Islamic Center, an $18 million facility built in 2004 that houses the Islamic Forum of Europe and its associated East London Mosque, also contains the offices of Muslim Aid, a member of the the Union of Good, which, in turn, is a worldwide coalition of charities headed by global Muslim Brotherhood leader Youssef Qaradawi that helps to raises funds for Hamas. Farooq Murad was elected in 2010 as the new MCB Secretary-Generaland and addition to his role at the MCB, Mr. Murad is a current trustee and former chairman of Muslim Aid. In 2009, the Investigative Project reported that Ashrafuzzaman Khan was an active leader of the Islamic Circle of North America (ICNA) and was under federal investigation to determine whether he failed to disclose his history with a paramilitary group when he applied for U.S. naturalization. The Islamic Circle of North America (ICNA) is a part of the U.S. Muslim Brotherhood and considered to be closely tied to the Jamaat-e-Islami organization of Southeast Asia, itself allied with the Global Muslim Brotherhood. ICNA is particularly close to the Muslim American Society and the two organizations have been holding joint conferences in recent years. In February of this year, Bangladeshi Jamaat-e-Islami leader Delwar Hossain Sayedee was found guilty of eight counts of war crimes committed during the nation’s 1971 fight for independence.